These images will demonstrate the skills of a professional photographer and why you should use an experienced photographer when you are looking for a Children and Baby Portraits. This low key (dark background) study of a pensive child, has a great deal of 'mood', and would look fantastic as a portrait hung in any home. Many professional photographers use creative techniques to create works of art from their images. A purpose designed background and studio set up has created this beautiful child portrait. 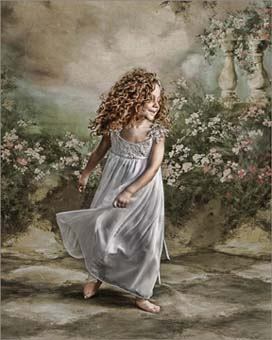 Classic lighting and posing has created a timeless child portrait, that would enhance any home. Modern day technology has enabled professional photographers to create multi image pictures, giving a unique child portrait. Classical posing and lighting along with the appropriate props has created a memorable child portrait. This monochrome images demonstrate the creativity of a professional photographer, the image is further enhanced by being black and white. Even parents can be used as props, this pro photographer has 'caught the moment' to create a portrait that any parent would cherish. An every day experience has been captured perfectly to create a great portrait of this child. Simple props and professional studio lighting has crated this thoughtful photograph of baby. Professional photographers are experienced with working with small children and can capture superb images. A loving portrait in monochrome of mother and baby. A timeless portrait of a young child in sepia tone, another technique employed by professional photographers.